Pentoses and hexoses are highly prevalent in biological systems. You probably only need to know a few of these. Let's learn some tricks to make them easy to remember & draw out. Now, I want to show you guys some easy ways to memorize the structures of a few of the important monosaccharides, so guys is in biology pentoses and hexoses are really highly prevalent and you probably need to know a few of these but you probably also don't need to know all of them. So, for example guys, for the hexoses there are so many, there are like 16 different hexoses with all common names that are different from each other, there are lots of pentoses as well, this section is going to depend on your professor, if your professor may want you to memorize all the aldohexoses in which case this video is not going to help you very much but most of the time professors don't care that much about the exact names and they just want you to be familiar with the most important structures. So, that's what we're going to try to do here, I'm going to try to summarize just some of the most important structures and give you guys easy ways to memorize them. So, just so you guys know, first of all, biological systems tend to recognize D-monosaccharides more than L- monosaccharides. So, all the structure we're going to talk about pretty much for the rest of this section are going to be D-sugars, okay? We're not going to talk about L-sugars anymore because they're not really used a lot in biology, okay? So, really one of the most important pentoses that you need to know is ribose. So, what I did was I took out all the OH's and all the H's that we can write them in together as you memorize it, okay? So, D-ribose would obviously have the last OH facing towards the right because it's a D but then where did the other OH's face? Well, this one is easy because it has a nickname or like a little saying, what you can say is that ribose is alright, and what that means is that all the OH's are to the right, okay? ribose is a very important pentose because it's the backbone for DNA and RNA. Remember, it's called deoxynucleic, ribonucleic acid. So, it's made out of a ribose. So, you need to know about ribose and then the other side would just be H's. 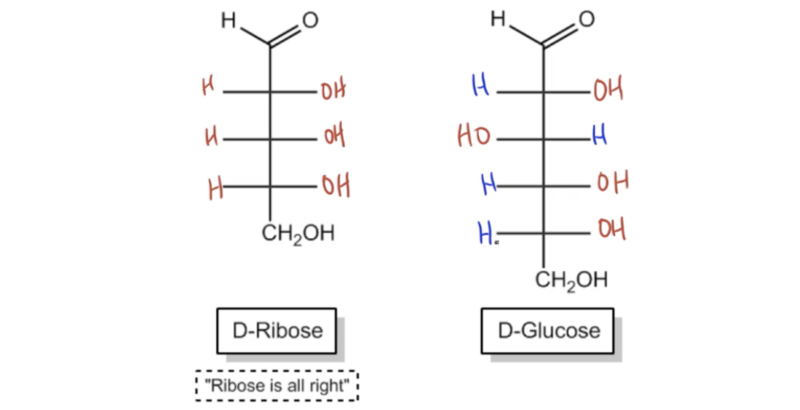 So, ribose is alright, easy enough right, cool? Alright, so now let's talk about glucose, come on guys glucose is super important, how do you draw glucose? Well, we know that if d-glucose would have the last OH facing to the right but then where did the other three go, okay? Well, guys this one's a little bit obscene. So, I'm not going to do it on camera but this is one of the ways that I found online that most student remember glucose. So, go ahead and take your hand take your right hand and put it in front of you and I'm going to this off the camera and make a fist. So, make a fist like this. Now, go ahead and flip yourself off okay, you guys saw it, right? You guys saw a little bit of my hand come up. Now, look down at that and notice that that's actually going to show you your position. So, it's going to show you your two, three, four and five positions where the finger that's being very rude to you right now is one of the OH's. So, glucose guys, it flips you off. So, it's going to look like this OH, OH and OH so those are your four fingers being represented by glucose giving you the big little finger, okay? And, that's what it's telling you, you know, right around holiday season or you know right, when you're going to go out and splurge on sweet, it's saying hey you're going to regret this later, so the H's are just going opposite places, cool? So guys, those are ribose and glucose super important but there are others that come up pretty often as well and thankfully these can just be thought of as related to the other ones that we learned especially glucose. So, mannose, we've already dealt with it earlier d-mannose is just the c2 epimer of glucose. So, we're going to draw glucose again. Remember, that it had the OH, the OH, the OH, but the C2 epimer ines that one position switched. So, then I would put this OH over here, that would be d-mannose, d-galactose would be the c4 epimer of glucose, so that means I'm going to draw all the other positions exactly the same, remember this is flicking me off over here, but now in this case I'm going to actually get it, guess I'm going to get flipped off by two fingers in the middle here. So, that would be the c4 epimer is galactose H, H, H, H, and then finally I'm going, I'll take myself out of the screen here, and what you're going to see is that D-fructose. So, fructose is a very important but is a ketose and it's actually going to be the ketose of glucose. So, think about that this was a glucose, let's draw in all of the different OH's that you would expect for glucose, H, H, H, H, but then remember guys that ketoses need to form on that second carbon in order to qualify as a ketone, right? So, that means that this one here just becomes a ketone and this would be called D-fructose, which is a six carbon ketose, okay? Specifically it's the fruit, it's the ketose of glucose, okay? Now, guys once again, I don't know exactly what your professor wants, this might be more than your professor wants, your professor might not want me to memorize a lot of structures or they might want you to memorize a ton, I'm just trying to help you with the most important ones and if you need to know more than this then I would, there are other videos that might be able to help you, okay? This is just like a basic overview of the most important ones and hopefully you found this helpful. Alright, so let's move on. From the aldopentoses given, identify and label all structures as enantiomers, diastereomers, or epimers of each other. Furthermore, determine the total number of stereoisomers possible. Identify and label the aldose, ketose, furanose, and pyranose from the structures given below.